The Department of Computer Science maintains a rigorous, state-of-the-art program with seven full-time faculty and typically between 150 and 250 majors. We offer research and advanced undergraduate elective courses in computer graphics, artificial intelligence, networks, software engineering, databases, human-computer interaction, game programming, and parallel processing. The hardware and software in our laboratories are continually updated to support our student and faculty needs. By pursuing a Bachelor of Science degree, you can prepare for a rewarding, challenging career in business, industry, or government, or establish a solid foundation for graduate studies and research. Millersville University began teaching programming courses in 1963 and the Computer Science degree was approved in 1975. The Department has graduated over 1,500 majors who have become active, contributing members of the computing profession. 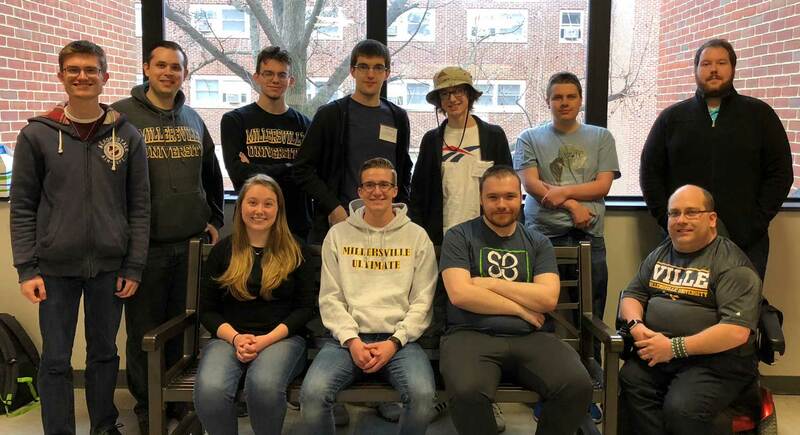 On the weekend of April 6th, 2018, Millersville University sent three teams to the annual PACISE conference to compete in their hosted programming competition. The competition, which runs from 8 AM until 12 PM Saturday morning, tasked teams of up to three students to solve 5 problems in the allotted time. The team of Ryan Peterson, Hugh Quinn, and Alayna Woleslagle placed first and solved 4 of the 5 problems. The team of Daniel Hartenstine, Connor Billings, and Henry Schmale placed third and solved 3 of the 5 problems. The team of Jack Fazio, Nick Russell, and Jessie Hildebrandt competed in their first competition and we look forward to their future contributions. Students from the CS Club are getting the opportunity (through funds from the MU Student Senate) to attend the Disrupt conference in NYC in May. TechCrunch Disrupt is the world’s leading authority in debuting revolutionary startups, introducing game-changing technologies, and discussing what’s top of mind for the tech industry’s key innovators. We wish these students safe travels and can't wait to hear about their experience! Jason Zimmerman, a recent MUCS alum (Dec 2015), will be spending this spring working as a NASA intern at the Johnson Space Center. Jason will be working on a team writing flight control software that communicates between Orion's Guidance Navigation and Control's (GN&C) Space Integrated GPS / Inertial Navigation Unit (SIGI) and Orion's Launch Abort System (LAS). He will be modeling the software with System Modeling Language (SysML), which encapsulates UML2 and also includes hardware modeling along with many other types of models. Congratulations to Jason for earning this terrific opportunity. The MUCS faculty are sure he'll make valuable contributions to his project at NASA! You can learn more about Orion's Launch Abort System at this address, http://www.nasa.gov/sites/default/files/files/orion_las_fact_sheet.pdf. Millersville University welcomes applications for a full-time tenure-track Assistant Professor position in Computer Science beginning August, 2018. If you are a Millersville University Computer Science Alumni, please update your contact information. At the top of the page please click on the "First Time Users" link.